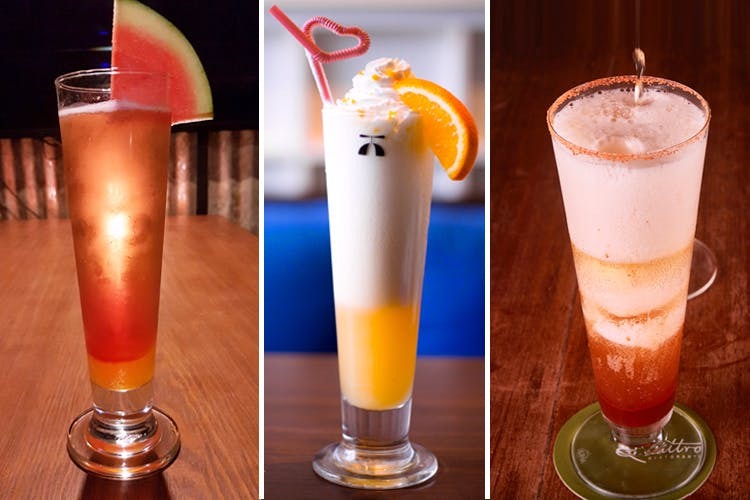 Beer-Lovers, How Many Of These Delicious Beer Cocktails In Mumbai Have You Tried? Figuring out a nice cocktail when on a night out can be task. Is it too sweet? Or is it too strong? Though we love our share of classic and even the most unique cocktails, we’re also loving the combination of beer infused cocktails and so we decided to find some amazing beer cocktails in town. At this relatively new restaurant and bar which also doubles up as a co-working space, we’re picking up beer sunset. It’s a musk-melon flavoured beer shandy, a concoction so divine we’re okay with skipping a pint of beer. If you’re in the mood for spicing things up a little bit but also don’t want to be too adventurous, then Beergrita is the companion for your evening. A modern take on classic margarita, it’s a concoction of beer, vodka, strawberry crush, kiwi crush and peach – all things wonderful. Delhi’s favourite Raasta came to Mumbai a few months back, and with them comes their amazing Bongtails. Order in White Rhino Bongtail which includes vodka, white rum, gin, tequila, whiskey, peach syrup topped with beer. From the land of Mexico comes this beer laden cocktail, Chilli Michelada. It’s a strong vodka infused cocktail with wheat beer with a pinch of chili and tomato juice for the flavours that hit you in all the right places. The newest cafe in town comes with its own amazing section of beer cocktails. However, our pick is the light and foamy orange cider. It’s a delicious mix of oranges and beer and super affordable. Quattro is a vegetarian’s paradise. However what they also get right is their beer cocktail – the spicy and yummy Michelada. It’s not for the light-heartef as it’s spicy, salted and slightly strong.